Consider the following the original code of one batch. It opens an input file, calls a process function on each of its rows and writes each of the processed input to an output file. It also prints the number of input rows in the end. Since we won't be running a loop for every line, how we calculate input count? Well, the process() function is called for every record in the RDD, so we create an Accumulator and increment its value every time it goes in the process() function. Finally, we save the input as a text file, and done! //You could avoid the Accumulator and print the count by the count() function. Why didn't we use count() for printing the count of all lines? Because it is another action. We are already calling one action - saveAsTextFile. Once this action is performed, the input RDD is wiped off the memory. So if we write another action (say, input.count() ) then Spark will re-create the entire input RDD just to call one count function. To avoid multiple processing for multiple actions, we just use Accumulators instead. Some people persist the RDD in the memory for the count() function. This is still not as good, because persisting the RDD in the disk will block a sizable part of the memory and the access time will increase too. Just knowing the data structure and its operations is not enough to understand how Spark operates. The order of execution matters. In fact, it is a concept which a developer has to always remember while writing the code so as to avoid any silly mistakes. Always remember - Spark is lazy. Lazy is the keyword while writing code. What exactly do we mean? Now, we can either perform actions or transformations on the RDDs. The transformations always created another RDD and that's it. Let's say after the application finished, these newly transformed RDDs would be dumped. There is no scope of these RDD variables outside the application. However actions, they are different. They return values. Maybe files or integers but they return something which has a real purpose outside the scope of the application. So when we say Spark is lazy, Spark doesn't execute it's tasks until an action is performed. Meaning, Spark is aware that transformations yield no value and it does nothing until it sees that an action is really performed on the RDD. The steps 1 and 2, are transformations while step 3 is an action. Since Spark is lazy, nothing will really happen until Spark reads step 3. This is a beautiful feature about this framework - the executors don't perform any process until they see there's something valuable coming out of it. Isn't that similar to human behavior? If we never called the step 3, i.e. we never saved that file, why would we even bother to do steps 1 and 2? It would be a complete waste of time and resources to perform transformations without actions (Its useless to perform transformations when the result won't be remembered in any way). While Spark is lazy, Spark is lazy-efficient. Perhaps more efficient than we as developers are. Like how Bill Gates believes that lazy people find efficient ways to do things. In the above example, while we imagined spark to be working like a batch job, i.e. read inputs then process them all and then write them all at once, it may really not be so. Spark will perform sequences of transformations by element so no data is stored. So in which case Spark behaves how? We cannot tell. But what we can surely tell is that we can trust Spark with the approach it chooses. It will always be efficient. I think its a good time now to understand how partitions are handled in Spark. Now, we may have several executors in our cluster. That is completely upto us, how we configure spark. But what is not upto us, is how data is partitioned in Spark. To cite an example, let's say we want to read input file of roughly size 10,000 bytes. We can only specify the minimum number of partitions that the input file can be divided into. Spark takes a judgement and decides how many actual paritions of the original file will be made. If we specified a minimum parition of 2, we'd expect Spark to divide the file into two 5000 bytes parts. But if Spark calculates that partitioning the file into 10 paritions will lead to optimized run of the application, it will create 10 parts of 1000 bytes each. And you as a developer can do nothing about it. You have to leave certain things to the framework and this is one of them. Similarly, the RDDs are also partitioned in reality. If we want to process an input file by loading it into an RDD, each file reads its partition, and created its "part" of the RDD. Which means, in reality, the whole RDD as we imagine it, is distributed across different executors. It is important to remember at this point that each executor is immune from the others. This means each executor has its own set of variables. So when the input file is to be read in partitions, the Spark Application just decides the size of the partition. It sends each executor a copy of the entire file and their starting and end point of the partition. Then that executor reads its particular part of the file. Note how each executor even has a copy of the whole file! Now, while writing into an output file, each executor will create its own partition of the output file and later the Spark Application will maintain it as one file. You also cannot control individual executors in any way. You can control however how all executors behave. How that would be? Well by implementing the spark API. The Spark Application partitions the data, something we have understood. But is the order of the records lost anywhere? The two transformations of map and filter will never change the order of rows. This means the nth line of the input is the nth record of the RDD and when mapped into another RDD, it still remains the nth record. However there are other transformations which are heavier and donot maintain the order. I haven't introduced them so far - groupBy and Join. You can read more about them later. You can imagine an RDD to be a set of records of any object type/ data type. Note that RDDs are immutable (just like Strings are). Let's try to create an RDD of Strings from a List and imagine how it looks like in an RDD. With this, we have learnt the first step of our batches: reading input. RDDs are immutable and cannot be modified, however we can create new RDDs from existing RDDs. In this way we can proceed to the second step of a batch: process the input. We will take the previous read input RDD and operate on it to create a new RDD which will be our processed RDD. We can also operate on our input RDD to create other values like integers instead of creating another RDD. Actions: These operations always return a value. Transformations: These operations create a new RDD out of the previous RDD. It is easy to note that transformations are the key for our second step in batches: processing. Let's look at each with examples. This is an action performed on an RDD. Count function, as name suggests just returns the number of elements in a given RDD. (The value is the count of elements in this case). Let's try to call count function on our RDD as before. Let's say we want to read from a Collection and write it into a file. How would you do it? You'd create the RDD from the database. But how do you save the contents of an RDD into a file? This function is used. Let's say we want to save our fruits collection in a file from before. The value returned above was a text file. This is an action performed on an RDD. With this we just learnt our third step of the batch: writing to output. Further, we'll see how the second step i.e. processing works. Map is a tranformation performed on an RDD. It performs a particular transformation/function on every record of the RDD. This becomes the key of our second step i.e. processing. What is processing anyway? We take each record and perform a function on it, right? So map is exactly that. Let's try to transform our previous RDD of fruits as an example. We already know that myRddOfFruits is an RDD of Strings. This means that the data type of each record is a String. So to represent each record in this RDD, we used a variable name inside this map function - fruitString. Thus fruitString is each record in the RDD. Just in one line a lot happened! In the fourth line of the code, we called the map function on our RDD. Let me further explain the functional syntax inside the map function. Further, inside the map, we have defined what our new transformed RDD should be. We have instructed, that for each fruitString, we want fruitString.toUpperCase(). The toUpperCase() also returns a String, so the data types match! Spark will create a new RDD, take each record of myRddOfFruits and make it upper case using the function provided by String class. This new RDD will be pointed by the variable myRddOfFruits. Let's say we called the count() function on myRddOfFruits before the map, we would get value as 5, right? What if we called count() after the map? It would also return 5. The map function runs for every record in the RDD. This means the count after map will always remain the same. Just like map, we passed a function inside the filter method. This time, we chose to call each record of the RDD as a variable named record. Note that we don't have to worry about the specification of the record. Then, we filtered our RDD such that only fruits starting with the letter 'B' remained in the RDD. Notice how the count() has changed! In short, RDDs are the fundamental unit in which Spark operates. We can perform actions and transformations on these RDDs to achieve our desired result. The actions return a value while transformations create a new RDD. The map and filter transformations follow a functional programming syntax where we operate on each record of the RDD using the lambda function. I'll introduce the main components of the architecture in order as follows. There is a manager of these workers, called the Driver Program. Many times this is referred to as the Spark Application itself. You just have to submit your application (the batch, in our case) to the Spark Application and it will take care of the rest. It will divide the whole application into tasks (e.g. : read input, process input, write output). It is also responsible for creating the groups of batches, or partitions (which is a more correct technical term). The driver is lazy (more on that in part 3). Spark is a framework - in order to use this framework, we need to create an instance of Spark Application. In order to do this, we create an object of the class SparkContext. It is crucial as it establishes the connection to the spark cluster. The special data structures that Spark uses cannot be created on the cluster without SparkContext. Thus each application has to have the SparkContext. Then there is a Cluster Manager (e.g. : Apache Mesos or Yarn). The Cluster Manager exists for resource management. It physically assigns all resources to all workers. Thus it works in coordination with the Spark Application and the workers. However the Spark Application is abstracted from the Cluster Manager's working. As a developer, we might never care to look into more details. However an operations person might be interested to look into its details. The Cluster Manager also runs the Spark UI where we can study the performance of the application. It lets you monitor running jobs, and view statistics and configuration. The worker we have been referring to above is called an executor. It is the slave in Spark's master-slave architecture. It receives tasks from the Spark Application and it's job is to execute them as per the schedule. It is important to note that each executor has its own set of resources (as allocated by the Cluster Manager). Which means, to start with, your application (the batch's jar/war file) is copied on to every executor. They have their own variables, cache etc. In effect, you can imagine each executor works independently. 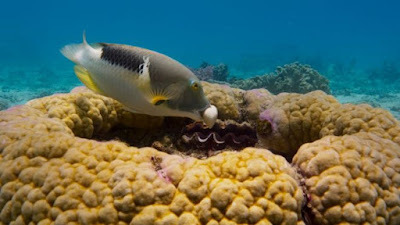 There is this fish in the Great Barrier Reef of Australia - tuskfish. He wakes up every morning and swims to the edge of the reef. Then he digs the corals and the rubble searching for something. It looks unnatural to watch something dig with its fins, no hands. But it continues, and then finally he finds a clam. He manages to hold it in its mouth and swim all the way back, except this time with the clam in his mouth. He arrives at his lunch table, its kind of a hollow coral with walls. Like a shallow well. It wastes no time, and it throws the clam’s hard white shell across the walls in an attempt to smash it. Nothing happens. He repeats, he keeps throwing the clam on the same spot with high accuracy. Not giving up. Finally there’s a small crack, after a hundred attempts. He throws it once more, with the same intensity and there, it breaks open. A small squiggly meat comes out and the fish devours it. The camera zooms out, you see inside the bowl shaped rock, so many - so so many of such broken shells, accumulating over days. The fish does this everyday, all its life. Its a mere fish. What do I have to complain about? There's so much hard work to do. Recently at Rakuten we successfully renewed our mainframe from COBOL to Java (an old Fujitsu to Oracle Exalogic) - press release. It was almost a 3 year long project and towards the end, the entire company was working on it. I transitioned into the development team for the mainframe, to rewrite several batches from Cobol to Java. Now of course I cannot read COBOL (although its not that different). We had a machine translation software convert the cobol to java but honestly, that was hardly anything. The converted code was not smart, it used zero OOP concepts, it used customized stacks to remember function calls (haha, imagine writing your own implementation to remember function calls) and it looked like COBOL just changed its clothes. As a result, these batches performed very slow - their performance times significantly higher than their COBOL counterparts for the same data. So the job was simple - to make these batches faster, in fact, much faster than their COBOL counterparts, otherwise what's the point? My team chose Apache Spark as a framework to work parallelly with data. In this post, I am trying to explore why they made this decision and how Spark looks like compared to traditional batch processing. Write to database and/or file. Assume we have an input file which needs to be processed and written into an output file. Assume we have 100 records in the input file. However we already use batch processing. We divide our input records into groups. Let's say groups of 20. That makes a total of 5 groups. This is also the approach that Spark takes to process our batches. The working of Spark is slightly different than the diagram above but we will come to the details later, in the next post. In conclusion, we can say that indeed batch processing is much faster than traditional processing. Further, the reason why parallel processing is faster than batch processing is because you operate with multiple groups at the same time instead of just one group at a time. Of course this means we need more resources to achieve this (e.g. : the number of workers required increases in the above diagrams). Batches which were being run on our mainframe, had very little logic to them. It was about feeding data from one process to another based on a bunch of conditions. Of course what I say is a very very simplified version of how it really looks like. But in summary, there was more work to do in getting the input and writing the output than there was in processing the data in between. Spark fit this choice because, even if we just got rid of the bloated processing of the converted code, we would have practically made no progress with the I/O operation. The logic processing would have pretty much remained the same. Apache Spark blessed us with the power of forgetting about the logic, and concentrating only on the I/O to speed up the processing times. It came with its own challenges, like writing the custom file readers and writers but that's the story of another post!